Many people mentioned that anyone who would marry as those that ship sailed home. That is because marriage, like those who will navigate the oceans. While still in the harbor, the sea was calm, many supplies and could still see the beautiful sunrise and sunset on the beach. It is a description of the newlyweds are still overwhelmed by a million happiness. When the ship set sail, the captain with the navigator will have to work hard through all kinds of storms and weather. It is like for many family problems that must be faced by a husband and wife. If both remain cohesive and hard work, all the storm will be passed by them. Because not all journey filled with storms, only occasionally. Well, what if problems come up again and again? Is it still worth mentioning with a happy family? 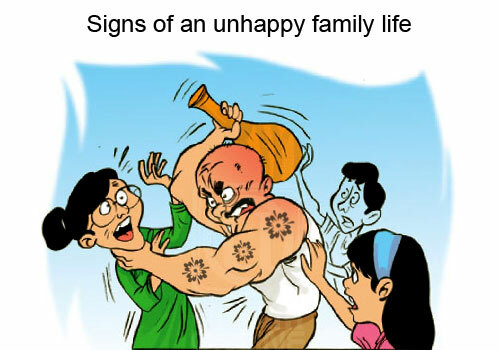 These 12 signs of an unhappy family life. Naturally, if there is a difference of opinion, it's two different heads. But if the couple would often argue almost every day and no one wants to budge, it's a pretty clear sign that there is no good running in marriage and family. Rude and disrespectful behavior is another sign of unhappy marriages. Some couples even mention partner with a call that was not good and was impressed harass, hurt and insulted continuously. Some couples are not only mutually cursing each other. They even throw objects or doing violence to each other. It also may be harmful to children if they already have them. If one partner has stopped communicating, as usual, s/he is talking, this is a clear sign of unhappiness in the household and marriage. While some couples choose to get into an argument or debate. Some couples decide to stop to communicate and keep their distance from each other. They stop sharing their thoughts and feelings with each other and stop consult each other on issues of personal or household. Couples in an unhappy marriage and household often busy themselves with other things to avoid the real problems. One characteristic of the family is not happy if the couple or one of them being too secretive about their activities. For example, if the couple often leaves room for personal calls or suddenly turn off the phone when the couple appeared in front of them. It is a sign to be cautious because maybe they are hiding something. A happily married couple often talked about their plans for the future. One sign of marriage and households are not happy is that the couple no longer shares their hopes and dreams for the future with you. If your partner suddenly starts spending more time with their friends regularly or more often than s/he spends time with you, it is a sign of a problem in your relationship. Your partner can even find a reason to stay home from work late just to avoid being with you. Often travel out of town made by one partner or both, extended working hours, more time spent in isolation with her/his friends could be a sign of an unhappy household. If your partner suddenly develops new hobbies and prefer to spend time alone without being with you, it is one of the signs that your household is in trouble. People like that can also display the attitude of escape from reality. If one party does not show signs of love or affection such as hugs, kisses or praise, then marriage has lost its spark of warmth. Often the couple also with a feeling of satisfaction compared to you with others or praising others in front of you. Even it is no longer holding hands, stroking the back is no longer present, and they typically will not sleep in the same bed as well. Lack of intimacy is one of the most common indicators of a lack of emotional connection. Although the sweetness of the honeymoon phase could not last forever, the loss of all forms of interest or lack of intimacy with a partner may be a sign of dissatisfaction marriage and unhappy household. Some people tend to think that they can drown their problems with drinking or use drugs. If these habits are suddenly starting to become a habit one couple, it may be a sign of an unhappy marriage. The occurrence Infidelity is a clear sign that an unhappy marriage or household. When infidelity occurs, it is tough to recover from it because once trust is lost, then it can not come back quickly. A husband or wife who was cheating is a clear indication of the household unhappy. For prevention of infidelity, you can also read the article titled 7 Ways to keep your partner from cheating on you. The body language between husband and wife can also indicate if the marriage or household is happy or not. Bad body language and behavior between couples can be an indication of an unhappy marriage. When the marriage and households are not happy, then it would seem that one of the couples will be selfish feelings. S/he will not care that their activities interfere with other people, or don't care about the needs of others. If one partner is suffering from depression or showing signs of depression, it is clear that he was not happy. He will feel the unhappiness in their marriage or the household if he feels alone in suffering. Some people may even have strong feelings about their regrets about the couples chosen by them. Perhaps many who lost weight or increased drastically because some people have also eaten more or eaten less when they are depressed. Many people enter marriage with unrealistic expectations, and when they do not get their hopes, the household becomes unhappy. There are also cases where couples first fall in love and lose the sense of interest in the partner. Sometimes other problems can also cause unhappiness in marriage and family such as financial problems or the pressure of work. There are also who got the problems associated with the law or children. When issues like it arise and protracted, and couples can not support each other, also entertain each other, then these are signs of an unhappy marriage. That's the 12 signs of an unhappy family life. Divorce is not the best solution. It's time for a change and together fix what has been lost all this time. 0 Response to "12 Signs of an unhappy family life"